She thinks I’m her Guardian Angel. I know I’m her worst nightmare. I thought I had everything under control. Until the day I saved Maggie’s life. Most men would melt if a girl like her looked at them the way she looks at me as if I was her savior, her protector. She sees the muscles, the tats, the hero the media makes me out to be. I’d give anything to be that man, to hear her screaming my name as I showed her exactly what a Marine can do in bed, but I can’t let her in. What I had to do in Afghanistan made me a monster. If I let her in… I might let it out. I belong over there, in hell. I don’t know how to live in the heaven that is Maggie. She doesn’t realize how hard I’m fighting to keep her away. She doesn’t know who I really am. Before she unleashes a monster that can’t be controlled. 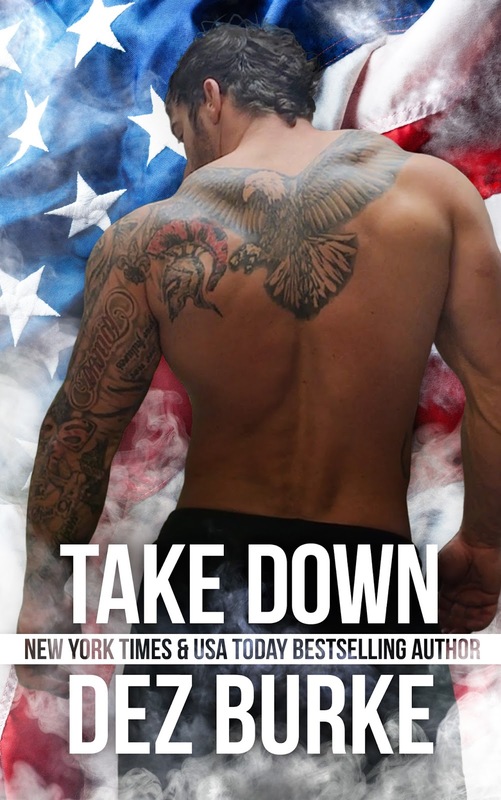 Take Down is a full-length stand alone romance novel with a guaranteed HEA, no cheating or cliffhangers! Take Down is 87,000 words and 418 pages long. I glance down at the small hand reaching over to cover mine. Maggie gently pries my clenched fingers apart and laces her fingers through them without speaking. The small gesture is a gut punch to my insides. I struggle to swallow past the pain I’m feeling inside. It’s almost too much to hope that she’s willing to give me a second chance. Especially after what I just put her through. I’m nothing but a total stranger. She doesn’t know me at all. Yet she’s willing to take a risk. It’s hard for me to believe someone would be willing to do that. Most of my life I’ve been alone. Scraping by and making it the best I can by myself without help from anyone. I don’t elaborate. I don’t need to. She knows what I’m asking. I feel the tension I’ve been holding in my body for what seems like forever slowly start to melt away. Lifting our hands to my lips, I gently kiss her fingers. My lips linger a long second. “Look at me,” she says. I’m afraid if I do, she’ll see me for what I really am. When I don’t, she places a hand on my cheek and turns my face toward hers. “How can you ever forgive me?” I ask, reaching up a gentle hand to lightly touch her neck. “I already have,” she says softly. With a defeated groan, I pull her close and crush my lips against hers in a desperate kiss. All of the emotions I’ve fought so long to keep in check come flooding out. I close my eyes and drink in her intoxicating sweetness until my head reels. Knowing that she’s willing to take a chance after what I did makes me crazy. She should run out into the night screaming for help. Instead, here she is, her lips soft and eager against mine. She’ll never know how much. New York Times and USA Today bestselling author Dez Burke writes hot, steamy books featuring bad boy alpha males.